My main research area is Software Engineering. This covers Empirically based studies and involves OO metrics, web metrics, requirements analysis and OO design in general. My research recently included a BT Research Fellowship which involved splitting some of my time between here and BT laboratories in Ipswich. The majority of my research relates to cohesion and coupling issues, in particular their measurement. I am also interested in OO reverse engineering and refactoring issues, requirements egineering and business process reengineering. Some of my recent work was in the program comprehension area and I do collaborative work on web metrics with a colleague at the University of Auckland in New Zealand, Dr. Emilia Mendes. Another area which interests me is the combination of AI techniques and software engineering and I have done work with colleagues at Brunel University (Dr. Stephen Swift and Dr. Allan Tucker) in this area. I have also done some collaborative work with Dr. Keith Phalp in the Empirical Software Engineering Research Group (ESERG) at Bournemouth University on prototyping. 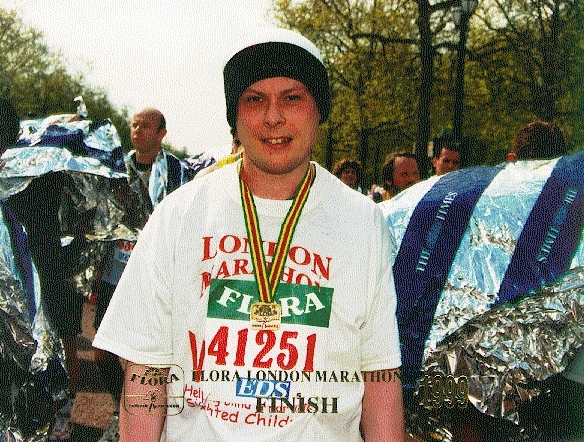 Here is a photo of myself after finishing the 1999 London Marathon which I ran for a visually impaired children's charity. I said never again....but took part in 2001 as well. I also do a bit of cycling and help run a self-defence class with a younger brother. Top people?.....well, DJ John Peel (RIP) has to be up there somewhere, so too triple jumper Jonathan Edwards, Fatboy Slim and the greatest footballer of all time (apart from Bobby Zamora) - Brazil's 70's maestro, Rivelino! Top musicians? : Marcus Miller, Curtis Mayfield (RIP), Stanley Clarke and Miles (who else?) As a final note - to Joe Strummer, 1952 - 2002. What a great band - the Clash and BAD.